Safeguard customer data, streamline PCI compliance. A credit card data breach can result in lasting brand damage and significant, long-term financial repercussions for an organization. Delego’s portfolio of solutions, featuring its proprietary tokenization technology, protects cardholder data from inception, allowing a merchant to never process, transmit or store unsecured card data. This approach allows for maximum PCI scope reduction, with the potential to reduce your SAQ to 26 questions. Delego Secure for SAP and Web intercepts sensitive card data before it enters your enterprise systems or applications and replaces it with a secure token. Our PCI-validated P2PE solutions encrypt card data at inception, before it enters corporate work stations or traverses your network. Combined with tokenization, this solution provides end-to-end security and maximum PCI scope reduction. Expand globally and enhance security with 3-D Secure. Delego MPI is certified to enable both Verified by VISA and Mastercard SecureCode and seamlessly integrates to your webstore. Tokenization replaces a credit card number with a randomly generated alpha-numeric string which is used in its place. 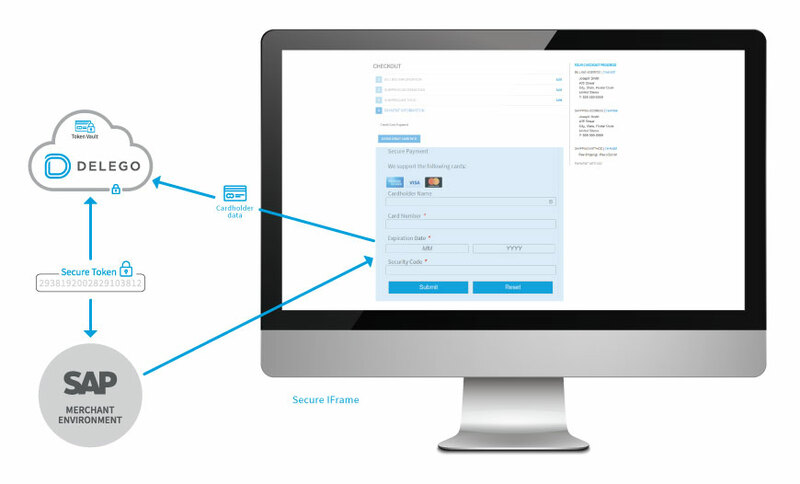 Utilizing a secure browser window or IFrame, Delego intercepts raw credit card data before it enters the merchant’s SAP system or web store. Credit card data is transferred to our cloud where a corresponding token is created and stored in our token vault. The token is returned to the web store or SAP. On authorization or settlement, Delego utilizes the token to retrieve the card number and communicate securely to the processor. Unlike encrypted data, Delego tokens cannot be reverse engineered to reveal the actual card number. Each token is unique to each primary account number and is never reused between merchants or saved in a shared database. Delego tokens maintain the ability to do BIN range, length and Luhn tests to prevent bad card data from entering the token database. The format of the token is configurable, allowing merchants to expose BIN range or last four digits for ease of use. Delego tokens can be used ubiquitously across a network of payment processors, allowing you to seamlessly service global customers and maintain flexibility with your choice of processor. Our tokens are persistent, and can be used for recurring transactions or saved on the Customer Master record in SAP for future use. Let’s talk about how Delego can help your business.